Vintage - Fine China of Japan, with the Royal Rose Pattern, Produced in Japan, in the 1950's. A (21) Piece Set, Service for (6) Six. 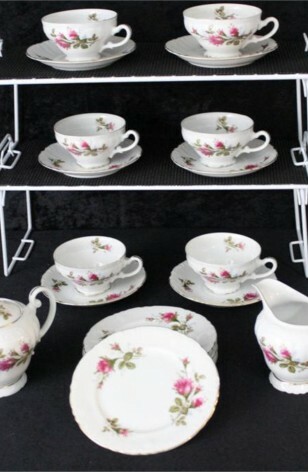 We are offering this Lovely Tea Set in Japanese Porcelain with the Royal Rose Pattern. This is a Red Moss Rose, with Green Leaves on Bright White Scroll Embossed Plates, Cups, Sugar Bowl, and Creamer. All Pieces are Trimmed in 22kt Gold on Rims, Feet and Handles. 6 - Luncheon Plates - 9 1/4"